Vegetarians can sometimes get a bad rap from the carnivorous paparazzi: veggie dishes are labelled as boring and bland, and a narrow-minded few believe that they live on a diet of salads and apples exclusively. Vegetarians, allegedly, don’t see the sun. They live a horrendous, bacon-less existence, full of hate, munching away on rabbit food. This view - to put it frankly - is painfully limited. One glance at the Pinterest search results for ‘vegetarian dishes’ proves it: the veggie diet is crammed full of innovative recipes, great meat alternatives and awesome health benefits (and, yes, the colour green - but it’s a good colour). With World Vegetarian Day coming up on October 1st, we take a look at some of the best veggie dishes to kick off your new, alkaline agenda. Unless you’re a dedicated advocator of full english breakfasts and maple bacon pancakes, chances are that you don’t involve a lot of meat in your breakfast diet anyway. And why would you need to, with such great veggie options out there? Wake up to the delicious scent of oaty granola bars, banana and cashew energy balls or warm, fruity muesli for quick munchies on the go. If you have a bit more time on your watch, why not try your hand at making this gorgeous dulche de leche pull-apart brioche or these raspberry swirl pancakes? They’re bound to give your belly that heartwarming wake-up it deserves - not to mention delight your flatmates and/or family. For a healthier kick, chug down a coconut and citrus smoothie and top it off with a handful of seeds or blueberries, both of which are crammed with antioxidants and other good juju, for that natural energy high. Everybody needs an extra lift on hectic working days, and we think veggie snacks are some of the best of the bunch - you can’t deny that roasted chickpeas and cashew hemp bars sound a lot better for you than a ham croissant or pepperoni bagel. Who needs that high cholesterol anyway? Buzzfeed has a great list of veggie ‘power snacks’ to boost your through your day - apple sandwiches and nutella energy bites? Yes, please. Avocadoes are the kings of delicious appetisers and are super good for you. Not only do they contain high levels of vitamin E, iron and potassium, they also contain super important monosaturated fats which lower cholesterol and low-density lipoprotein. 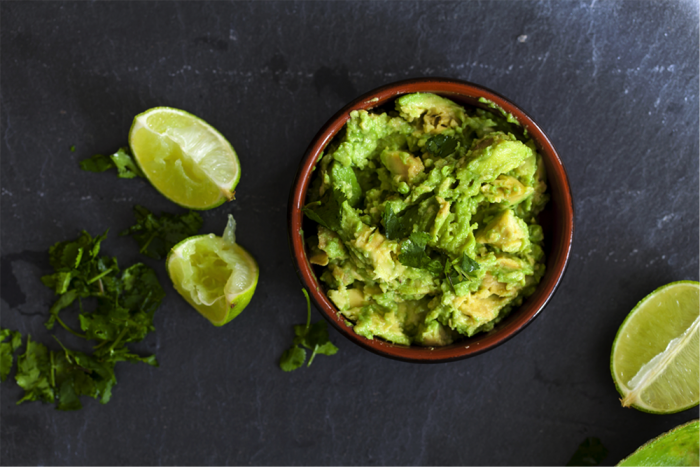 Give your dinner guests exactly what the doctor ordered by serving up a delicious treat of avocado hummus taquitos, cream cheese and avocado wontons or carrots and celery with creamy guacamole. Anything meat can do, veg can do better. At least, we’re pretty sure that’s how the saying goes. For quick exchanges, throw out the cheesy bacon fries for loaded sweet potato wedges, topped with sour cream or this brilliant roasted tomato chutney. Alternately, instead of pigs in blankets, have a go at these brilliant broccoli tots - made with egg, onion and the anti-inflammatory super-veg, they’ve also got a gorgeous colour which will add aesthetic razzmatazz to your table. If you’ve gone for a ‘wet’ main dish like curry or soup, there’s a range of gorgeous veggie breads you can throw into the mix, too - such as Martha Stewart’s herbed flatbread, this zucchini green chilli cornbread or olive bread swirls - which we think are some of the tastiest food ‘soakers’ you’ll ever indulge in. When your belly is crying for something filling, it can be hard to resist the temptation of a deep pepperoni pizza slice or chicken pot pie. But veggie dishes can do comfort grub and showstopping pieces just as well as their meaty nemeses. For lunch, why not trade in that pastrami sandwich for some creative ‘Kale’sadillas, red pepper and goat cheese paninis, falafel wraps or roasted pumpkin soup? You’ll feel lighter for eating greener (unless you eat all of the above at once! ), without having sacrificed your tastebuds. For your evening meal, divvy up some sweetcorn and sweet potato burgers, veggie thai curry or spinach and ricotta cannelloni to encourage ‘oohs’ and ‘aahs’ from your lucky dinner guests. On the other hand, if you’re not a kitchen-whiz, dinners don’t have to be a complicated effort - there are plenty of simple veggie dishes to sink your teeth into as well, such as simple pasta meals with garlic or avocado sauce, or cauliflower crust pizzas. Mmm. 6. And finally - dessert! Much like breakfast, meat doesn’t often feature in desserts - but vegetables can. British-based blogger and chef, Kate, shares her vegetable-infused desserts on her blog, Veggie Desserts, proving once and for all that a steady diet of vegetables can be delicious as much as healthy. Try her coconut oil and sweet potato brownies or avocado oat cookies with raisins and chocolate - they’re exquisite. There’s lots of room to be unique in the rainbow world of fruit and vegetables: have fun, get inventive and send those tastebuds wild.